Mouseover slideshow to see captions. 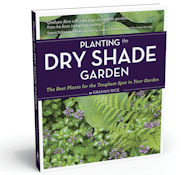 These ten plants have proved they will grow well in dry shade. Evergreens tend to predominate as they can utilise the available light through the full twelve months of the year. Of course, the more light and moisture levels can be increased by improving the conditions, the wider the range of plants from which to choose. Tough and resilient evergreen shrubs, the best forms feature variegated foliage, red autumn berries - or both. The large oval, foliage may be glossy green or speckled, edged or splashed in yellow and although variegated forms may be a little slower in growth, they are still splendid performers in dry shade. Silvered ivy-shaped leaves arise from a steadily expanding tuber, fading away in summer then emerging in autumn to last through the winter, even under weeks of snow. Pink or white flowers are held on short stems in late summer. It is perhaps surprising that a fern should thrive in dry conditions but once established the lacy evergreen fronds of D. filix-mas are unexpectedly tolerant of drought. Shade, of course, they enjoy. The erect mid-green fronds are divided and divided again into opposite pairs of leaflets. 'Cristata' and 'Grandiceps Wills' are prettily crested at the tips if the leaflets. Evergreen barrenworts including E. x perralchium and E. perralderianum have bright yellow spring flowers held over tough but elegant holly-like foliage held on wiry stems. 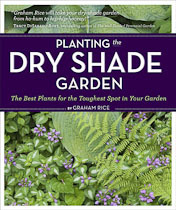 Amongst the most reliable for dry shade making good, weed smothering ground cover as well as dainty cut flowers. An old favorite, effective and well-behaved as both ground cover and as a self-clinging climber on walls and tree trunks. The evergreen leaves are edged with cream in spring, fading to white and developing attractive pink winter tints. Slender, pointed, rich green evergreen leaves arch from a tight crown and amongst them purplish flowers appear in early summer followed by unexpected bright, orange-red berries. Forms in other colours are occasionally available, try them all. Climbing hydrangea roots naturally at the base of trees, a very dry and shady place, then climbs the trunk using its aerial roots. In summer, the plant is covered with 25cm white lacecap flowers. Also good on walls in poor light. With its low spreading habit and its neat, nettle-like but non-stinging, foliage completely silvered or with a central silver splash, this is an easy and valuable plant which roots as it spreads but is rarely a nuisance. Two lipped red, pink or white spring flowers sit well just about the leaves. An easy biennial developing a bold winter rosette of dark green leaves then erupting in spring with airy spikes of our-petalled flowers in purple shades or white. These are followed by flat silver seedheads, about 3.5cm, ideal for drying. There are also forms with white-splashed foliage which add a whole new dimension. This tough-leaved evergreen has rich green leaves the texture of old dry leather with large scarlet berries on female plants. One of the most adaptable of all plants, Butcher's broom will steadily and relentlessly spread, but only slowly is are never invasive. The cut stems are useful and last an extraordinarily long time. Look for one of the self fertile forms such as 'Christmas Berry' or 'Wheeler's Variety'.